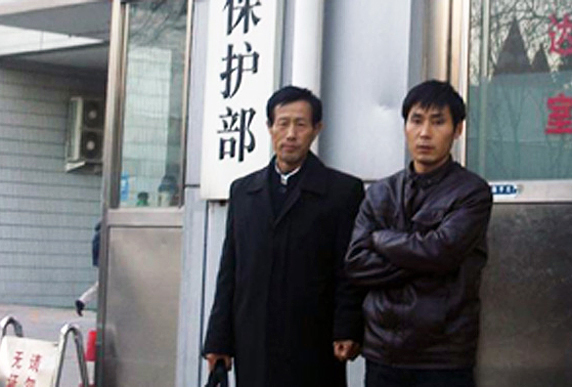 The farmer, pictured with his lawyer (left), who originally applied to the Anhui Provincial Environmental Protection Office for information disclosure. Green Anhui’s precedent-setting cases bring justice to communities in China. Our partners are on the frontlines of environmental justice in China. In two precedent-setting cases, Green Anhui made sure that people and grassroots groups can turn to China’s courts to force local governments to disclose information about the effects industrial projects may have on people’s health and the environment. The first case started when Green Anhui sent a routine information disclosure request to the local Environmental Protection Bureau of the city of Anqing, asking for a list of its most polluting industries. Under China’s Open Information Law, governments are required to disclose information, or at the very least say why they cannot share information. Despite repeated outreach to the city government, Green Anhui never heard back. So they decided to bring a lawsuit against Anqing city to force it to provide the information the group had asked for. In a surprisingly bold move, the court sided with Green Anhui and ordered the city to provide the information requested. This lawsuit sends a strong message to local governments throughout China that they are required to follow China’s Open Information Law and disclose how government-approved projects, like large-scale factories, impact the environment and the health of local citizens. Through Pacific Environment’s help, we established five new water pollution monitoring teams along the Huai River. In another ground-breaking case, Green Anhui filed the first lawsuit in Anhui Province’s history in which local people sued the provincial government. A new synthetic fiber factory on the banks of the Yangtze River was polluting local farming villages. Alarmed by the poisonous sewage and foul-smelling gases, villagers alerted the local media. Journalists uncovered that the factory was discharging neurotoxins like hydrogen sulfide and carbon disulfide, which may cause irreparable damage to the brain, spinal cord, and nervous system. this is a traditional way of making a person’s signature more official. Green Anhui mobilized its legal team and discovered that the local government had issued an environmental impact assessment for the factory without public participation, which is required by Chinese law. 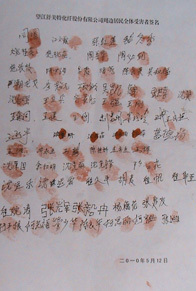 Green Anhui knew that it had found another case that could set an important precedent. Staff found legal representation for the farmers who filed lawsuits against the company and the local government, and the factory was forced to close down for a while. Though the court ultimately decided in favor of the factory, the lawsuit­- together with extensive media coverage of the case -demonstrated clearly to the local government that environmental impact assessments need to involve the people whose health and livelihoods may be threatened by proposed developments. Since Green Anhui started helping us, the polluting factories in our village have been relocated and our drinking water has improved. We farmers are happy now, and I’m volunteering for Green Anhui to help more people. Green Anhui and local farmers are now capitalizing on the momentum built by the lawsuit to pressure the factory to install new technologies that will filter the chemical pollutants more effectively. Clearly, even though Green Anhui lost the fight against the chemical factory in court, they have won another victory in the larger battle for clean water, which, every day, is fought by communities all across China. The lawsuits were made possible by Pacific Environment’s direct financial and technical support to our partner Green Anhui.